A review of Threatening Lives: Controlling Avian Flu in Vietnam’s Poultry Economy, by Natalie Porter. Since its appearance in 1997, highly pathogenic avian influenza (HPAI) has infected millions of commercially raised birds, compelled the mass culling of flocks, and inflicted costly losses for poultry farmers and regional economies. In 2003, the H5N1 strain of HPAI was identified in Vietnam; the new strain was infectious to humans, among whom it has since inflicted fatalities at alarmingly high rates. Despite the efforts of national and global health workers to contain the novel malady in Vietnam, it is now endemic among the country’s poultry stocks. Protean, fast-moving, and virulent, HPAI has raised anxieties about the emergence of a strain that could be transmitted readily between humans, causing a pandemic. Natalie Porter’s research on the recent experience of avian influenza in Vietnam focuses on the disparate disease control efforts that global, national, and local health agencies have attempted to implement there. Pushing a Foucauldian construct into conversation with animal studies, she traces how interventions that are “microscopic and macroscopic, local and global, caring and deadly, commercial and clinical, affective and rational” (p. 2) interact to produce “bird flu biopower:” a suite of techniques for governing life across the species boundary. As she shows, the shifting fortunes of these distinct modes of power also disclose conflicts between disparate interested parties in defining and managing avian influenza and its constituent assemblages of living beings. Her work builds and expands upon previous social science studies of bird flu and its politics, distinguishing itself by focusing on poultry – specifically, chickens and ducks – instead of viruses or people. In Porter’s introductory Chapter 1, “Avian Flu in Interspecies Perspective,” she establishes the stakes of her research with a discussion of the biosecurity threat that avian influenza poses and the shortfalls of established modes of international public health governance to date in addressing zoonotic outbreaks. Grounding her intervention at the convergence of literatures on risk and biomedicine, biopower, animal studies, and human-animal relations, she further demonstrates the interdisciplinary ambitions of her research: perhaps most broadly, Porter aims for an anthropology that decenters humans and investigates “how agency emerges through interspecies relationships and interactions” (p. 34). Porter also describes her methods, which were impressively far-reaching. She conducted multi-sited ethnographic research, including four and a half months’ residence in a poultry-farming family in the Red River Delta and a four-month field study in the Mekong Delta. From 2008 to 2009, Porter conducted participant observation and interviewed policy makers, poultry farmers, veterinarians, and local leaders. She also collected and analyzed quantitative data on poultry production and a wealth of avian influenza policy documents. These experiences allow Porter to supply a richly detailed account of the shifting cultural, economic, and biopolitical significance of poultry-human interactions in Vietnam. As she points out, similarly nuanced and experience-near investigation has been absent from conceptualizations of avian influenza that are developed for the purposes of disease control. As a result, attempts to contain HPAI have often hinged on schematic and untested assumptions regarding how human beings relate to the birds they steward. Porter’s facility in Vietnamese, ethnographic observation, and critical theory therefore position her strongly to rethink the stakes of avian influenza interventions as they are implemented on the ground. From a disease ecology perspective, Thủy and Thi’s production practices were disastrous: mixing flocks of various origins, breeds, and ages, and moving poultry products short and long distances on foot, bicycle, and motorbike where they exchanged all manner of biological materials with humans and other animals. However, this type of farming was common in Vietnam’s Red River Delta at the time of my fieldwork (p. 78). Proceeding to detail the epidemiological progression of HPAI in Vietnam, Porter contextualizes her field research in a key moment: “at the country’s turn from emergency-phase to longer-term pandemic preparedness responses” (p. 87), an opportune time to survey disease control efforts ethnographically. From this point, Porter transitions into the four body chapters of her dissertation, which focus individually on the cardinal interventions that health agencies pursued to manage the reality of HPAI’s entrenchment: vaccination, risk mapping, behavior change, and biosecurity. As Porter shows, these measures advanced distinct ontologies of avian influenza, which informed their subsequent targeting of viruses, territory, human behavior, and human-animal relations. In Chapter 3, “Vaccination: Molecularizing Interspecies Relationships,” Porter examines the logic underpinning mass vaccination of potentially affected poultry as a strategy for limiting the spread of avian flu. Porter argues that this strategy created a heuristic of avian influenza at microscopic scale, focusing on viral causes to the exclusion of other potential inputs and scales influencing bird flu transmission. Indeed, despite a wide degree of disagreement regarding the utility of this approach, and the recognition that inoculating fowl en masse could not constitute more than a temporary “technical fix,” policymakers nevertheless continued to implement it through 2011 (p. 102). Porter also explores how controversies over the viability of the vaccination strategy demonstrated how readily the nature of a zoonotic disease can become contested. As Chapter 3 establishes, and later chapters confirm, a key piece of advocating for a given health intervention was concretizing a claim about the inevitably slippery ontology of a disease made of constituent parts – viruses, poultry, people, and the links between. Casting HPAI as a problem of “viral loads” and “viral shedding,” vaccination proponents placed humans in molecularized relationships with agentive viruses and passive poultry carriers. […] However, the negotiations that ensued from this intervention revealed that prioritizing a viral risk could not account for the political, social, and economic determinants of HPAI (p. 124). Therefore, though the conceptualization of HPAI as primarily caused by a virus borne by passive bird bodies had great staying power, it also oversimplified and occluded the potentially causative influence of more motley, agentive, and complex relations between classes of beings. Despite this oversimplification, vaccination was also difficult to implement: in an ethnographic account, Porter evokes the challenges that underfunded, overtaxed state veterinarians face: overwork, impassable roads, burning hot weather, missed appointments, and, not least, flocks of ducks that “squirm, kick, and bruise me with their wings” (p. 130). Chapter 4, “Risk Mapping: Spatializing Interspecies Relationships,” leverages maps and map-making interventions as inroads to an analysis of bird flu biopower. As Porter suggests, maps of avian influenza’s spatial dimensions constitute both an attempt to document interspecies contact and draw blueprints for future intervention, charting “human-animal interfaces in particular places [and] opening them up to mechanisms of surveillance and discipline” (p. 152). Once drawn, maps concretize worldviews and their concomitant ideological prerogatives, sometimes introducing unpredictable power effects along the way. For example, the legacy of vertical, compartmentalized administrative hierarchies in Vietnam made taken-for-granted approaches to governing territory – in which communes report up to districts, who report to provinces, who report to the capital – ill-suited to creating outbreak surveillance maps that accurately reflect the cross-boundary movement of birds, humans, and infection. Memorably, Porter describes an outbreak map where “the areas surrounding Đồng Thấp, including nearby Cambodia, display no information… Indeed, the province is surrounded by white space” (p. 164) – scuttling the pragmatic end of controlling an infectious disease that moves freely across borders. Similarly, “value chain maps” failed to account for the non-commodified activities of poultry, creating another class of cartographic blank spots. Chapter 5, “Behavior Change: Disciplining Interspecies Relationships,” describes two interventions that attempted to reshape the behaviors of poultry producers, an approach which offered the promise of sustainable, long-term management of avian flu. This Chapter posits an interesting problematization of the tendency of critical analysis to find that neoliberal health governance removes responsibility from states and transfers it to private persons. Porter’s data show a much more complex and cross-cutting model of health governance. Further, she suggests that these interventions do not simply target individuals or social groups, but instantiate “a unique form of individual self-government with animals” (p. 189), a theme she develops throughout the Chapter. Indeed, her case studies demonstrate the exercise of highly heterogeneous and internally frictioned forms of power – in which, for example, one project was “funded by a multilateral donor and managed for a for-profit firm in partnership with an international humanitarian organization and local health officials” (p. 195). Such collaborations were typified by the marginalization of local officials and the empowerment of health workers with limited experience of Vietnam and of the poultry industry, however – an outcome of broader shifts in the order of the global “development” industry. One can readily imagine the problems that this situation might engender, and Porter, who worked as a participant observer with the two behavior change campaigns, is well positioned to explore the ramifications of casting behavior as a “technical problem” (p. 200) and “like commodities” (p. 213). In the first intervention she discusses, the “Three Priority Behaviors” campaign, Porter finds a struggle to reconcile the imperative of a for-profit programmer to design interventions whose cost would ultimately be borne by the population and the desire of a Vietnamese mass organization to implement models requiring external funding. Disagreements over the degree to which the program details should be fully spelled out, then, reflected not only beliefs regarding whether “farmers know best,” but also had implications for the political economic directions that bird flu would impel in target communities. In her analysis of messages and images the second campaign developed to change behavior, Porter shows how the secondary “Participatory Farm Modeling” project advanced a vision of individuals “intertwined with and responsible for [their] poultry” (p. 219). However, the history of top-down governing in Vietnam complicated the uptake of initiatives to “empower:” both government officials and citizens themselves were wary of the initiative for laypeople to assume the responsibilities of bird flu prevention. It was at this moment that the majority of the focus group participants walked back to the main road to stand under the shade of a mango tree and smoke cigarettes, leaving the intervention programmers and myself to practice biosecurity alone (p. 253). As Porter persuasively shows, biosecurity is materially challenging to implement, but its cultural disjunction from a range of Vietnamese norms may constitute its most serious hindrance. The main imperative of biosecurity is species separation, or “removing poultry from its place in local economies of commerce and care” (p. 235). The ideal of disentanglement between species, however, often proves only ambiguously achievable in practice: as Porter notes, the contact zones between poultry and people on Vietnamese farms are so broad and diffuse that it is difficult even for a team of experts to know where to remove their shoes before entering a “poultry holding site.” Further, the networks of care between poultry and their human stewards cannot be easily severed, because poultry furnish a unique form of glue between people. Moral economies and poultry economies are deeply enmeshed: rearing chickens is partially based on the ability to welcome guests, share resources with neighbors and kin, and release birds to range free over rice paddies, where they compose “symbiotic people-poultry-rice relationships [and] play a determining role in co-producing ecological niches” (p. 243). In further challenge, some of the novel protocols of biosecurity flew in the face of practices that the Vietnamese state had previously supported. For example, disinfection had been promoted by the state to control HPAI; “spreading disinfectant on the dirt pathways demarcating household borders” was commonly practiced by health agents and resonated comfortably with the “technocratic governing strategies central to [Vietnam] since the revolutionary era” (p. 252). When international policy statements suggested that these measures would be ineffectual, given the disinfectant’s propensity to be neutralized by organic material, the state was brought up short. Here, Porter’s account of the microdetails of everyday practice gets literally down to the ground, bringing dirt specks on a motorbike – and their potential to spread pathogens – into unnervingly high resolution. Porter closes Chapter 6 with a discussion of a biosecurity simulation held on a farm in North Vietnam. This curious event, staged mostly for the benefit of funders of an intervention, was stage managed with considerations about what was and was not a “realistic” depiction of village life. However, as Porter suggests, there is no precedent for “biosecurity” in poultry farming villages, where resource limitations preclude the acquisition of expensive equipment and everyday practice does not accommodate the idealized following of steps when a sick chicken is found. Here, as elsewhere in this research, programmers contend over constitutes “reality” versus mere “theory” – a critical question for disease control, but also a philosophical question whose consideration enriches Porter’s discussion of technical problems. In this vein, Porter’s characterization of the simulation event as “a simulacrum for new modes of coexisting” (p. 260) is both apt and provocative. Here, as elsewhere in her analysis, Porter captures insights from the complex social worlds of contemporary Vietnam with great depth, detail, and acuity. Having begun with fatalistic scenarios of future mass bird flu casualties and the implicitly technocratic visions that accompany these apocalyptic forecasts, her discussion concludes in a place that is deeply local and negotiated, almost personal, inhabited and made by individual people and birds. The arc of her dissertation implicitly underscores the value of ethnography in apprehending how health policy is negotiated and how it may succeed or fail. As her chapters show, efforts by NGOs, global health agencies, and the state to impose standardized interventions for preventing bird flu were frequently unable to come to grips with the realities of local practice – which is, in turn, inevitably structured by history, culture, and the contingencies of the present moment. Though Porter’s primary aims do not include the remediation of these efforts, her work should be required reading for avian influenza programmers. Complementing her closely observed ethnography, Natalie Porter deploys a theoretical language that is nuanced and rich. Her work is both a signature contribution to Vietnam studies and a work that will enrich medical anthropology and animal studies, maximizing the potential of theory as a lingua franca between disparate fields. Original, lucid, and beautifully written, Threatening Lives succeeds not only on its own terms, but in its recombinant potential to impel new conversations between disciplines and new conceptualizations of life politics. University of Wisconsin-Madison. 2012. 316 pp. Primary Advisor: Katherine A. Bowie. 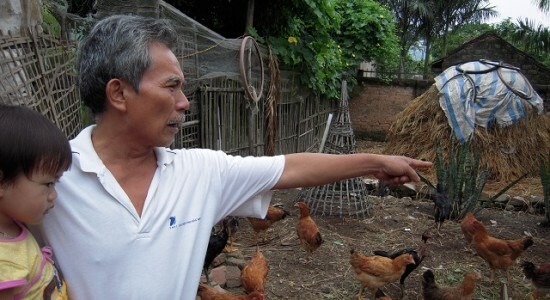 Image: Household Chicken Farmer, Northern Vietnam – 2010. Photograph by Natalie Porter.